Yoga Elements is yoga, breath, and meditation based on solid research into the mind, body, and communication. We assist individuals and groups to develop awareness, discover their potential, and cultivate a healthy body-mind. Our unique teaching approach makes for deep and transformative learning experiences and meaningful self-discovery. For total beginners and experienced students who wish to slow down and learn in detail. These classes focus on breath, movement, sun salutations, standing poses, twists, and forward bends with the focus set by the teacher from week to week. OK for complete beginners! สำหรับคนที่ไม่เคยเรียนโยคะและผู้ที่เพิ่งเริ่มฝึกโยคะ ต้องการเรียนโยคะแบบค่อยเป็นค่อยไปอย่างละเอียด คลาสเรียนนี้จะเน้นฝึกการหายใจ การเคลื่อนไหวร่างกาย การฝึกชุดท่าไหว้พระอาทิตย์หรือสุริยนมัสการ ท่ายืนต่างๆ ท่าบิดตัว และท่าโน้มตัวไปข้างหน้า โดยมีคุณครูคอยแนะนำอย่างใกล้ชิดทุกสัปดาห์ คลาสนี้เหมาะสำหรับมือใหม่ที่เพิ่งเริ่มฝึกโยคะเป็นครั้งแรก! Best suited for new and experienced students, these well balanced classes focus on learning and practicing arm balances, backward bends, and inversions. Please know that these classes more challenging than our Elements ‘A’ class and not suggested for complete beginners. Yin Yoga is the form of yoga which targets the deep connective tissues and the fascia that covers the whole body; enhancing the flow of energy to keep your health in good condition. What makes this class so special is that while you feel relaxed with yourself, your muscle will be stretched and softened to the fullest at the same time. Much deeper meditative state, greater wellbeing and long-term body restoration are the results that you can gain from practising Yin Yoga than other conventional yoga styles. And when learning Yin Yoga, you may become aware of tensions stored within the body and once you release all these pressures, you can access to the sense of clarity. No experienced students are welcome. 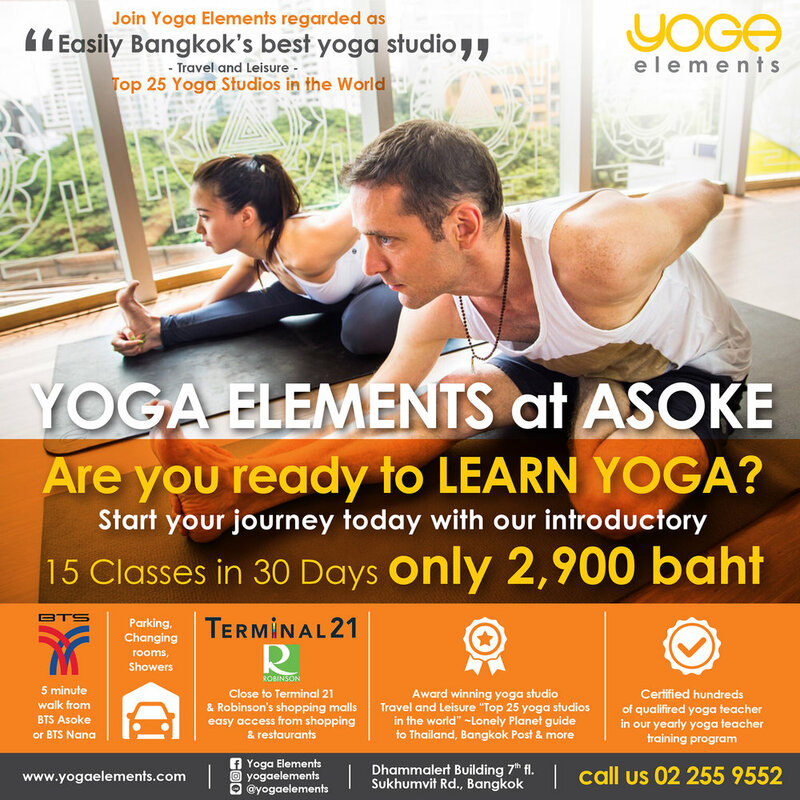 A yogic workout with arm balances, stronger backbends and handstand practice for the experienced students of yoga. Our signature 2 hours class a total yoga experience to leave you centered and inspired!